ECOPLUG MAX® is an efficient method to prevent regroth from leaf trees. reduce chemical use up to 90% compared to previously used methods. ECOPLUG MAX® is a little ingenious plug that is inserted into a tree or a stump to kill it and eventually eliminate it and its regroth. When you cut down one or several leaf trees new sprouting will commence almost immediately. ECOPLUG MAX® is an 100 percent effective method dealing with eliminating the sprouting from broad leaf trees. It 's a selective method that will reduce the use of chemicals by 90% compared to traditional methods. The active ingredient is released inside the plant that is to be exterminated. ECOPLUG MAX® is mainly sold in Sweden and South Africa where the product is being manufactured by VUKUHAMBE (stand up and go) by handicapped local workers. Minimize the use of chemicals during treatment of trees and stumps. The product will kill off the entire root system, but only the root system. Neither people, animals or the enviromnent will be exposed to our product. 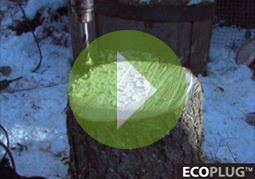 By utilizing ECOPLUG MAX® the stump/tree will die. Treat the stump by applying the plug immediately after felling, in fresh wood. To check if the wood is alive, drill a hole from the side and check the saw dust coming out, it should be moist. ECOPLUG MAX® is applied for approval in the US by the Environmental Protection Agency USA.